This report covers activities between October 2017 and September 2018. 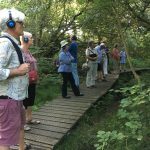 The main focus of the year was mounting the production BytheWay: Sounds in a Common Wood at BytheWay Common and Field, Colehill. We also took on some new initiatives and developed our skills in several areas. Building on our previous successful fundraising efforts, we continued to raise funds for this and future projects. A number of workshops were mounted to explore the techniques we hoped to use in the BytheWay project. 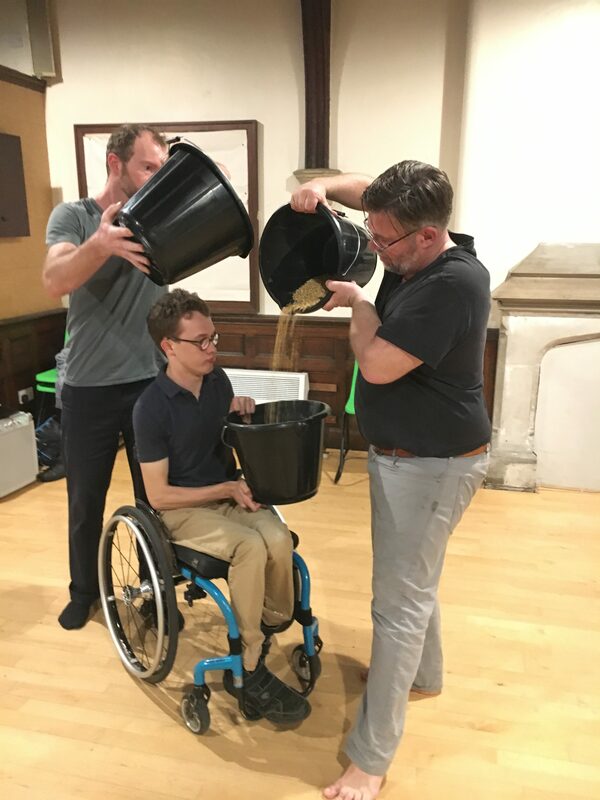 On 28th September, Karen Wimhurst led an enjoyable session Singing for Theatre, exploring body percussion and rhythmic breath sounds, as well as developing songs for the production. On 19th October Jasmine Taylor led a session, Movement for Theatre, in which we choreographed a routine for the Navvies’ Scene in the play. On 23rd November, Adrian Newton led Sound and Performance where we recorded material and experimented with the newly acquired headsets. 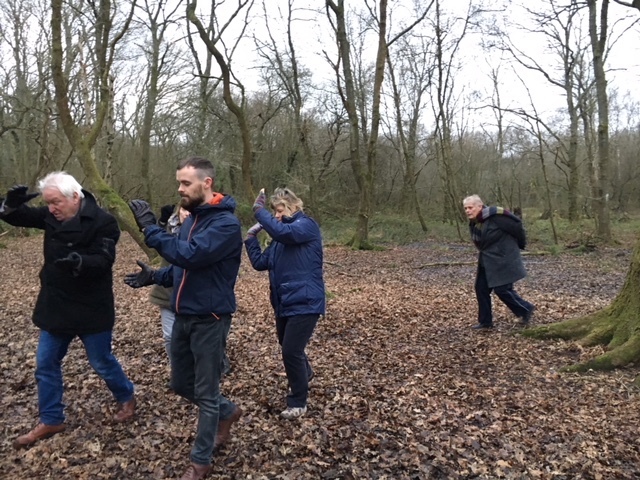 Finally, on 13th January 2018, John Billington led us in a workshop on site, Voice and Character in the Open Air, where we concentrated on voice projection and conveying character and meaning in open spaces. The rehearsal schedule started in January 2018 indoors and later on-site. Headsets were purchased by Adrian Newton and WCT hired these to use in the production. These will now be available for WCT to use in future productions. 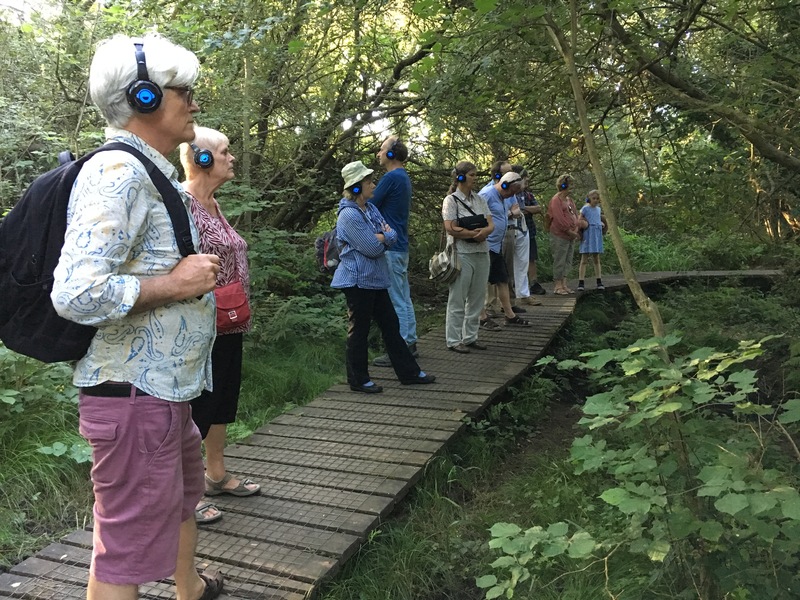 A soundscape was developed through research into BytheWay’s flora and fauna, history and future planning as well as poems and legends related to woods and the open air. The Creative Group met five times to visit the site, draft an outline and plan the route for the production. We were fortunate in having the expertise and support of Hannah Bosence, the Countryside Officer from Christchurch and East Dorset Councils. We met with Adrian Newton regularly to record sounds, poems and text which would become the soundscape for the production. A Planning Group of Gill, Tuppy and Barbara worked to oversee the operational aspects, such as ticket sales and publicity. 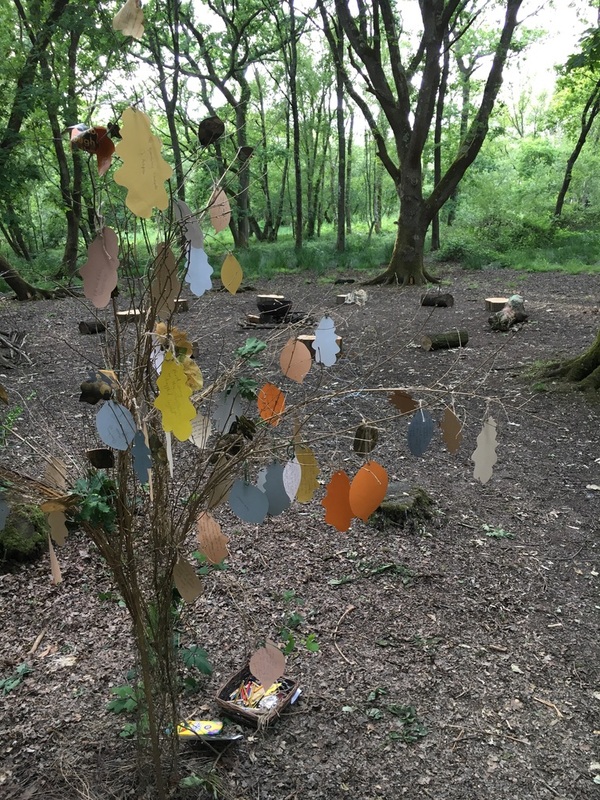 In May Clare and Hannah Small hosted a series of four craft workshops to make fairy doors, bridge decorations and the famous Naiad puppet, Iris Willow-Walker. The group were able to learn and develop valuable skills as well as creating some of the props that were used in the production. A number of back-stage volunteers were recruited who proved to be a real asset working on front of house, sound and stewarding on a difficult site. A useful link was made with Wimborne Movie Makers Club who later produced a video of the production and made it available on the website. Michele O’Brien joined us to work with the group on movement which became a key aspect of the production. We are indebted to Pete Ferrett who at short notice provided and performed the music for the final scene. The play was performed on 15th, 16th and 17th June at 5 pm and 7.30 pm. It proved to be a successful venture as reflected in the audience evaluation feedback. 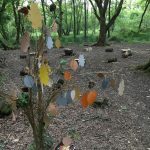 The audience seemed to love the experience of their sonic journey through the woods and many of the comments written on leaves by the audience were moving and reflective. It was particularly rewarding that the innovative use of the headsets was praised by the audience and we thus achieved our goal of trying to introduce a new way of working with every production. 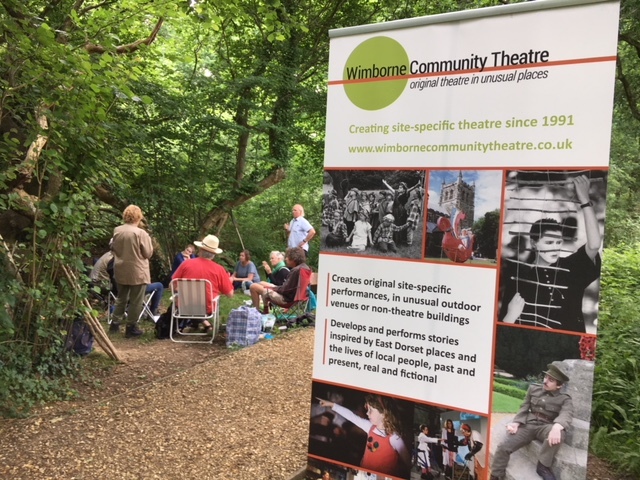 After the production the cast assembled on 23rd July to experience the soundscape from the audience’s perspective and enjoyed a walk though the wood followed by a picnic. 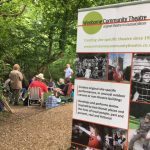 We also followed up the production with a Film Premiere on 13th September 2018 at Wimborne Movie Makers mini-cinema. An enjoyable party for members was held at Jeff and Barbara’s house on 15th December 2017 which also raised funds through a raffle run by Clare. Throughout the year there was ongoing work on the website, in particular posting archive material related to What They Left Behind and also for BytheWay: Sounds in a Common Wood. Gill and Barbara met several times in the year to review and update the content and continue to post news of our activities regularly on the website. We held a Quiz Evening on 1st November 2017 at the Colehill Sports and Social Club which raised £349. We also held a Skittles Evening at the Coach and Horses pub on 27th April 2018 and raised £262.00. We are grateful to John Billington for hosting both of these events. On 13th July we held our annual Treasure Trail around the streets of Wimborne. Thanks are due to Barbara and Jeff Hart for compiling the trail and Clare Small for providing a hamper for the raffle. Over £226 was raised for WCT funds from ticket sales and the raffle. £800 grant was awarded for the BytheWay production from Colehill Parish Council. Our annual subscription to LocalGiving was cancelled at the end of 2017 as it was no longer providing benefit to the group. The Steering Group continued to meet monthly to plan events and development, particularly the production of BytheWay: Sounds in a Common Wood, as well as to ensure that the group’s administrative affairs were in order, dealing with matters such as finance, insurance and Safeguarding. Last year’s AGM was held on 16th May 2018 at Tony and Gill Horitz’s house to review the year October 2016 – September 2017 and elect officers for the following year. The Steering Group remained unchanged, with additional support from Stewart Bullen on membership and subscriptions. From the 19th to the 21st April some members of WCT took part in a series of workshops led by Silvain Cousin from Bistaki. 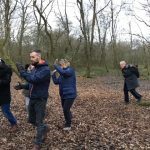 We learnt new techniques for Physical Theatre using shovels and bags of corn! This was a very positive experience for the group and it was unfortunate that our planned involvement in their production of The Baïna Trampa Fritz Fallen for the Inside Out Festival in September 2018 did not materialise due to lack of funding from Inside Out. However, we hope that we will be involved in the future if more funding is secured. We were invited by ScreenPlay to be their administrative services partner in a new project, Voices from 1918. They were awarded a grant of £10,000 to create a blog based on research into the stories of local people as they experienced events in the last year of the Great War. As partners, WCT was awarded a £500 administration fee. On 22nd September 2018 WCT took part in a local initiative to draw attention to the unnecessary use of single-use plastic. Clare again led us in two workshops on puppet-making and re-invented Iris Willow-Walker as the giantess of the hill. 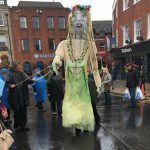 The group recorded a poem adapted by Tony from the children’s book Giant, which was played as we processed around the centre of the town. 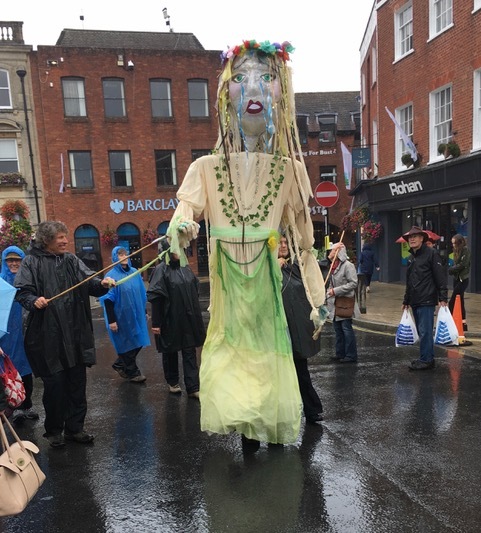 We later ran a puppet-making stall on the Minster Green for children but, unfortunately, it was a very rainy day and attendance was poor. At the end of the year under review, we were invited by Priest’s House Museum to work on their Revival project by commemorating the closing of the museum in 2019 for refurbishment and its re-opening in 2020. 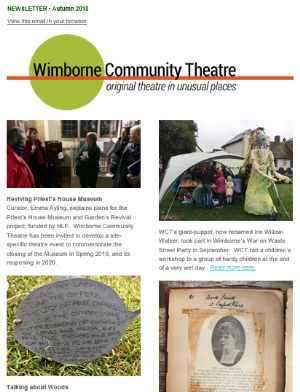 WCT has been awarded £6,000 from the Priest’s House Museum HLF grant to mount these productions. 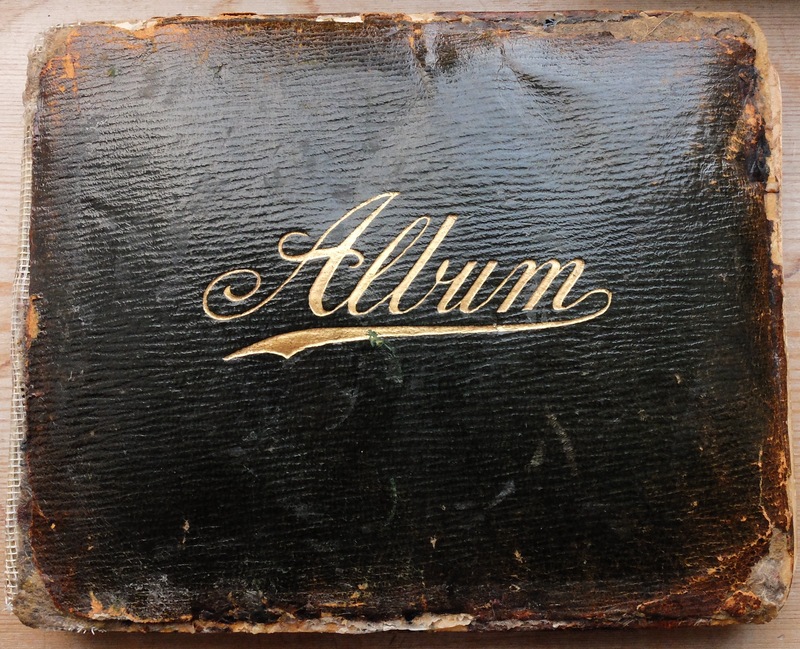 We made a start on this project with a workshop led by Tony on 10th October 2018 on Instant Theatre based on our responses to the Priest’s House Museum. We are grateful that Nashir Karmali offered the use of a room at Alchemy for this. Thus 2017 – 18 was a successful year with our staging of BytheWay: Sounds in a Common Wood and we also managed to extend our creative skills, particularly in sound and craft. This report also reflects the increased breadth of our activity in other projects and community initiatives. We would, however, welcome new members as the core group is now relatively small. We raised close to £1,000 through three events to help finance the group and we are grateful to supporters who come along to events and fundraising activities. Our thanks are due to several key people who continue to promote and develop the group’s work, in particular Tony and Gill Horitz. Also, Tuppy Hill, our secretary, and Adrian Williams, our Treasurer, who manage the affairs of the group extremely well and also thanks to Ian Metcalfe for reviewing our accounts. 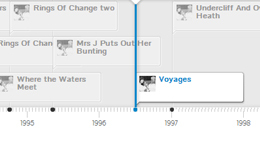 Finally, there was a great sadness this year with the loss of Dunja Wood. Dunja performed in the group’s opening production of Voyages in 1991 at Kingston Lacy and was a stalwart supporter of the group, from steering group member to costume designer, photographer to back stage support. Nothing was ever too much or too difficult for her, and she met every challenge with a positive and cheerful manner. Dunja’s creativity and calm presence will be very much missed by everyone at WCT but she’ll always be an invaluable part of the company’s development and history.